Last weekend, I took part in Scott Kelby’s Worldwide Photo Walk, where groups all around the world got together and took photos. There were only three groups meeting in the Portland area and all were downtown, none of which interested me. I wanted to find a place where I have never been or rarely go to. 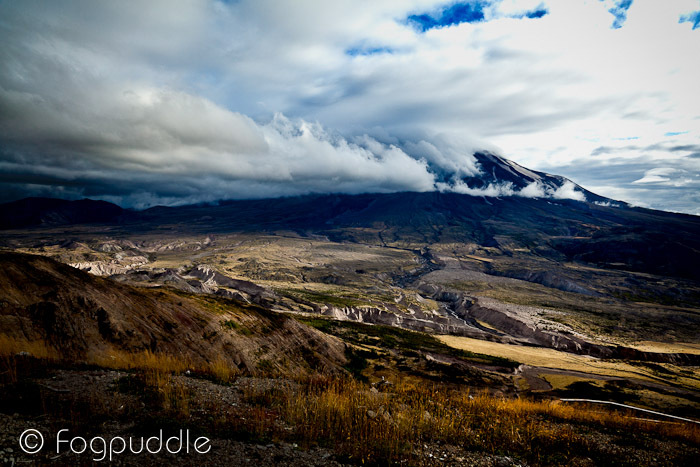 I broadened my search to all of Oregon and Washington and found a place I was excited about, Mount Saint Helens. I packed up my gear and headed out. My wife, Julie, wanted to come along and be my assistant. It was a little over a 2-hour drive. In the many years I lived in Portland, I will shamefully say that I have never been out to the mountain before this experience and that was a mistake! We drove up I-5 and took exit 49 to get onto the road that leads to Mt. St. Helens. It was 52-mile climb to Johnston Ridge Observatory that sits at just above 4300 feet, 5 1/2 miles from the crater. With the clouds rolling through the mountains, I could tell it was going to be a breathtaking experience once we got up to the observatory . I was eager to pull off the road and start taking photos, but I was on a time crunch to meet the group at 2:30pm. We finally arrived and I spotted the group right away, satisfied to see that it was a bit smaller than other worldwide photo walk groups I was involved with in past. I could tell this was going to be a good group because they were willing to take the time to drive out there and had a love of nature;I was right. I joined the group, met our group leader, Scott Batchelar, and we were on our way. 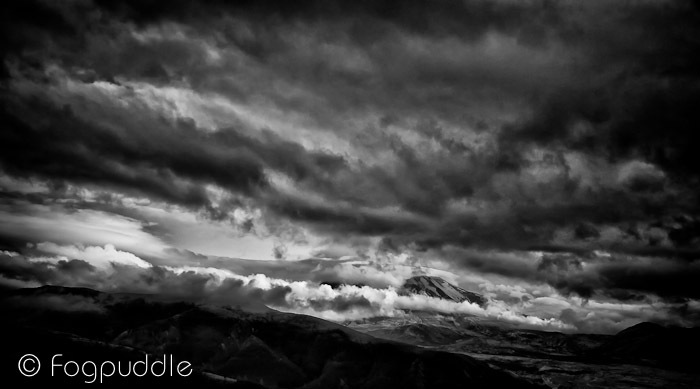 By the time we walked around and up the hill to get to a good spot to start shooting, a big cloud had moved in front of the mountain. It was a disappointment at first, but it encouraged me to look around at the smaller things and that’s when inspiration hit me. 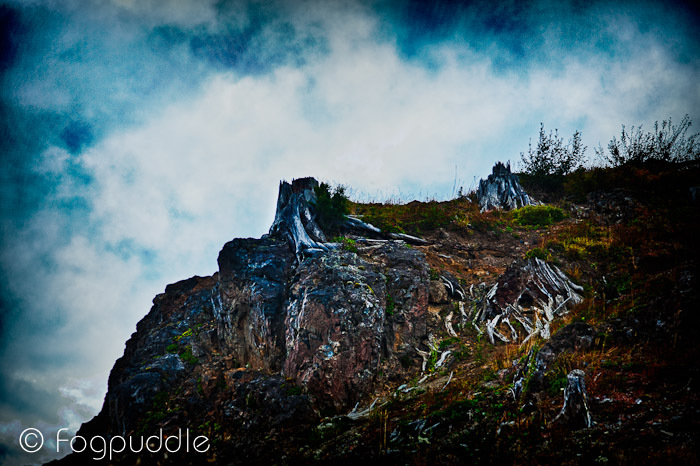 I saw some tree stumps on a hill and I envisioned the composition and that it was going to be an HDR shot right away. I went ahead and started taking multiple exposures for the HDR photo. UPDATE: The HDR photo has been updated from the original posting to bring out the detail of the stumps and have it a little bit brighter overall. By the time the tree stump photos were taken for the HDR, the sun started to peek through the clouds and cast a brilliant light across the landscape. This was the moment I was waiting for and couldn’t have been any happier. Looking behind me, I saw sun spots along the road we drove up on. Looking to the right of the above shot and at the mountains in the distance, there was another scene I could not miss! Brilliant light was all over the place that I could not keep up with everything I wanted to capture on camera. It was a truly breathtaking experience. Within our group, we had Ken Sandusky of US Forest Service take us to the Coldwater Visitor Center, which was closed to the general public in 2007. From there, we were able to see the the mountain 8 miles away as well as Coldwater Lake. We were able to walk on their paved trails and enjoy the sights and sounds of the area. 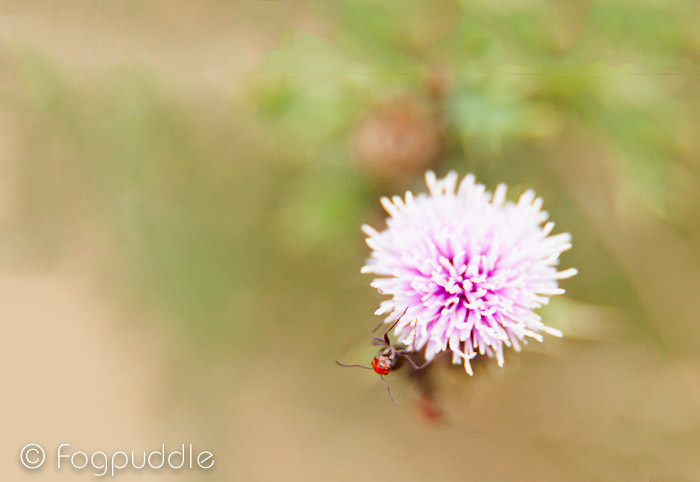 For a moment, I took my concentration away from the mountains and focused on the real small things. I put on my macro extender and started taking photos. It was not until I got home and viewed it on the big screen that I had a cool shot. Can you spot what makes it neat? 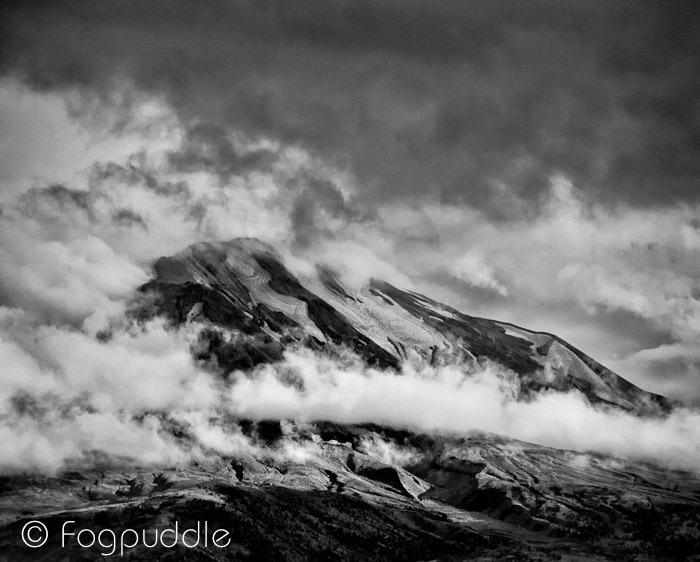 Turning my focus back to the mountains, the clouds were still hanging around. I could not resist in taking a few more photos. When I returned home and looked at the last shots on the big screen, they were just beautiful in black and white.